This ornate yet subtle piece is a classy addition to your home. The combination of mother of pearl & metal will take you on a design rich journey. Add charm & eloquence to your beautiful memories. Works well on any table, shelf, coffee table book, office or living room. 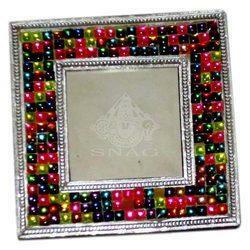 Our company is the pioneer in offering Decorative White Metal Photo Frame. 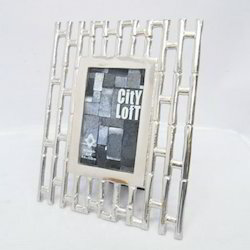 We have lots of collections of white metal photo frame. These are designed and fabricated by using advanced technology and according to our customer needs. Furthermore, these are very admirable in the market for their beautiful patterns and designs. White metal fitting picture frame. A nice combination of wood and white metal. This handmade gift articles is part of our esteem white metal gift article collection. We are offering a quality range of Metal Creeper Photo Frames. A marvellously handcrafted white metal photo-frame with explicitly carved floral design.